Pets and strays will habitually visit the same areas, seeking familiar animal scents, to perform their “duties.” When Liquid Fence® Dog & Cat Repellent Ready-To-Use2 is sprayed in these areas, it will mask the familiar odors, causing the animals to become uneasy, thus repelling them. 1. Slide down product label. Remove sprayer. 2. Grasp hose tip and pull coiled tube out of sprayer head until fully extended (See Figure A.). 3. Without removing cap from bottle, remove cap sticker and flip-cap, exposing opening. 4. Firmly insert hose tip into cap opening until it “snaps” (See Figure B.). 1. SHAKE WELL BEFORE EACH USE. DO NOT APPLY DIRECTLY TO ANIMALS. FOR OUTDOOR USE ONLY. 2. Adjust nozzle to spray or stream. 3. To prime sprayer, direct nozzle toward surface to be treated and squeeze trigger several times to draw liquid up through length of tube. Note: Keeping sprayer head below the level of liquid in bottle will make priming easier. Turn nozzle to OFF (X) position. 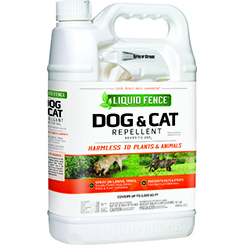 Apply Liquid Fence® Dog & Cat Repellent Ready-To-Use2 directly to landscaped beds, trees, shrubs, garbage cans or bags and other areas where pets and/or strays are not wanted. Effectiveness will last a week or more and continue to work as long as the repellent is present. Simply repeat applications as necessary. This product will not harm vegetation. Before spraying on objects such as outdoor furniture or decking, test a small area for staining potential. Training tip: Initially, to break a pattern of habitual behavior, the repellent may need to be applied more frequently. As the animal’s behavior is changed, the application frequency can be reduced. Liquid Fence Dog & Cat Repellent Ready-To-Use2 can help your pets learn the correct behaviors that will make them become part of the family. SHAKE WELL BEFORE EACH USE. DO NOT APPLY DIRECTLY TO ANIMALS. FOR OUTDOOR USE ONLY. 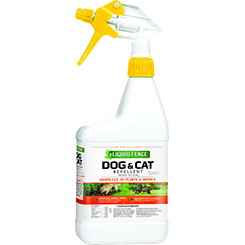 Apply Liquid Fence® Dog & Cat Repellent Ready-To-Use2 directly to landscaped beds, trees, shrubs, garbage cans or bags and other areas where pets and/or strays are not wanted. Effectiveness will last a week or more and continue to work as long as the repellent is present. Simply repeat applications as necessary. This product will not harm vegetation. Before spraying on objects such as outdoor furniture or decking, test a small area for staining potential. STORAGE: Store in original container, in a cool, dry area inaccessible to children and pets. Protect from heat and freezing. Store between 40°F and 90°F. Keep containers closed tightly to prevent evaporation. If spillage occurs, dilute with water and flush away. CONTAINER DISPOSAL: Do not reuse empty container. Dispose of empty container as required by municipal or local laws. CAUTION. This product may be harmful if swallowed. Avoid contact with eyes. If contact with eyes occurs, immediately flush with plenty of water. Seek medical attention if either occurs. Liquid Fence Co. represents that this product is a minimum risk pest control product and qualifies for exemption from EPA registration under the Federal Insecticide, Fungicide and Rodenticide Act (FIFRA).